Is he the next Manny? Pacquiao's eldest son Jimuel enters the world of boxing. 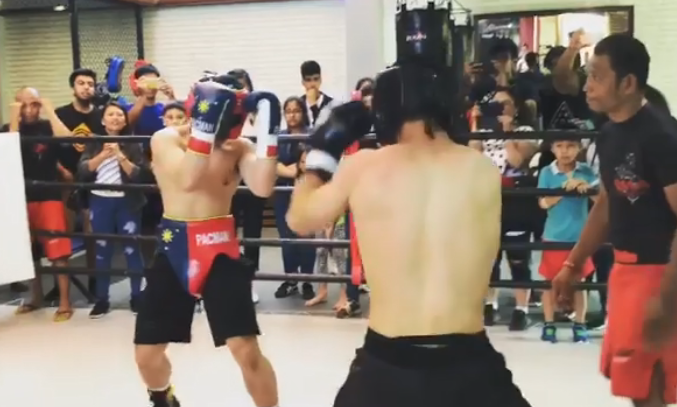 In the video shared by sport news reporter Dyan Castillejo shows Emmanuel Pacquiao Jr. 'Jimuel' in the boxing ring for his first amateur fight with schoolmate Lucas Carson. It was an action packed bout of just 2 rounds with entire team Pacquiao supporting Jimuel. "Emmanuel ‘Jimuel’ Pacquiao Jr aggressive in Rd 1 knocks down opponent schoolmate Lucas Carson," Dyan wrote in her post. His father Pacquiao was able to see his match through a video call - fair enough as the poor opponent might get intimidated seeing the eight world champion. Just like his dad, Jimuel's dream that someday he could represent the Philippines on the ring. Jimeul, the eldest of the five Pacuiao's siblings is making his name not only inside the ring but also in showbiz magazines and a new face of local brands.